URISA is launching an innovative online GIS Assessment Service in 2015 based on the GIS Capability Maturity Model (GISCMM). 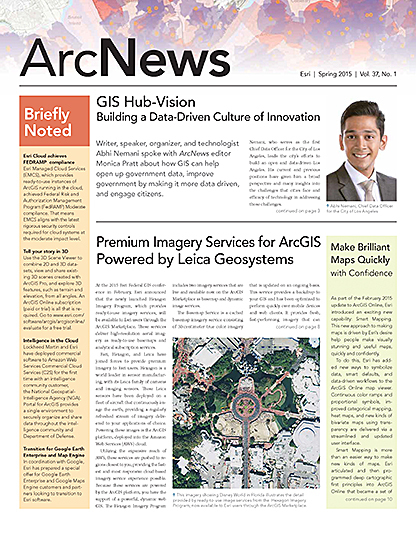 Several organizations have already used the published GISCMM and performed their own internal GIS assessment process. This article describes three of these efforts that were conducted by the San Jose-Santa Clara Regional Wastewater Facility in California, Hennepin County in Minnesota, and King County in Washington. In 2013, URISA’s GIS Management Institute (GMI) published GISCMM, which is intended to allow GIS operations to assess the maturity of their organization and compare them against a standardized framework and rating mechanism for enabling capability and execution ability. Enabling Capability is defined against 23 individual components. These components describe aspects of a GIS operation that are purchased, developed, or otherwise acquired. They are the assets of a GIS operation and include things like framework, business data layers, data maintenance, data coordination and availability, GIS design and technology, software and applications, management and staffing, governance, and financial resources. Enabling Capability components are assessed against a scale that describes how close the organization is to possessing each asset category. Execution Ability is assessed against 22 components that focus on the process maturity of the organization in key operational areas. Execution Ability includes topics like GIS service development and delivery, end-user support and quality assurance, various aspects of operations and management, collaboration, strategic alignment, legal/policy compliance, and social responsibility. Execution Ability components are assessed against a classic five-step capability maturity model scale that describes progression from ad hoc processes to fully optimized application of best practices. Shortly after the GISCMM was published by URISA in 2013, the San Jose-Santa Clara Regional Wastewater Facility (RWF) applied the model to its GIS operations. The City of San Jose Environmental Services Department operates RWF to clean wastewater before it flows into the South San Francisco Bay. RWF is owned by the cities of San Jose and Santa Clara and also serves a number of other cities, sewer districts, and unincorporated areas. RWF is the largest tertiary wastewater facility in the western United States and is located on 2,600 acres—the size of a small city. Tim Hayes, RWF senior geographic systems specialist, contacted the GMI Committee for guidance on applying the model against RWF’s GIS operations. The GIS assessment completed by RWF was quite extensive and it was accompanied by concise comments and selected documentation to validate the self rating. Within the Enabling Capability components of the model, RWF is rated very highly for almost every component. However, one component highlighted a challenge faced by many GIS operations: metadata. RWF has begun work on this with the resources available to complete the development of this component. Within the Execution Ability portion of the model, most RWF GIS processes were rated at level one (ad hoc) or level two (repeatable). However, some very key process maturity components are rated at level three (defined). These included application development, quality assurance, process event management, contract management, and staff management. GIS software license management is rated at level four (measured and managed). These higher ratings validate the progress that RWF can make in other areas to leverage its existing GIS investment. The assessment that Hayes produced for RWF helped the organization identify strengths as well as operational areas that needed to be prioritized. The completion of the assessment and feedback on the model itself helped GMI refine the model for launch of the online GIS Assessment Service. In 2014, as part of a strategic planning effort, Hennepin County, Minnesota, conducted a partial assessment against the GISCMM. Many strengths and opportunities were identified, among them being a strong geospatial data infrastructure. The county had collaborative data sharing and sound best practices to allow geospatial data sharing countywide. Hennepin County identified the need to continue focusing on its geospatial data governance and striving to strengthen its geospatial data stewardship countywide. For decades, departments across the county have managed their data within their own environments. With increased focus on the county’s geospatial data, including Public Safety’s NextGen911 implementation and a newly adopted Open Data Initiative, the county is realizing the level of maturity that is required to maintain reliable, quality geospatial data. A cultural shift in how the county thinks about geospatial data is provoking sharing of data publicly, enabling opportunities such as the county’s first code-a-thon, which is scheduled for early 2015. All these developments were made possible by a strengthened, more mature geospatial organization. The GISCMM assessment helped to identify the very measures that the county is now taking to improve the organizations’ process maturity and improve the quality of geospatial data stewardship. The county has taken proactive measures to establish new tiers of governance including a Data Governance Board, a Data Governance Strategic Council, and an appointment of a new data officer position which support the defining of roles and responsibilities behind stewardship of services and geospatial data. In mid-2014, the King County GIS (KCGIS) Center began a self-assessment against the GISCMM. This review was conducted by the entire KCGIS management team. This team effort was a way to validate individual ratings and gain new insights into issues that KCGIS must address. Within the Enabling Capability components, the assessment spotlighted areas where ongoing business data maintenance must be improved. In many cases, problem datasets are maintained by external data stewards. The KCGIS GISCMM assessment will help engage data stewards so they can improve data quality and currency. As a fairly mature GIS, most other KCGIS ratings were quite high, except for GIS Application Portfolio Management. The assessment revealed that KCGIS has to move toward a more consistent and integrated approach to custom GIS application development and maintenance. King County agencies are required to develop and report on a wide range of performance metrics, so many of the Execution Ability components of the model were rated at level three (managed) or level four (measured). Two areas of improvement were identified. Application development and project management methodologies need to be defined to move up to level three in these areas. The importance of mature defined system management and process event management practices was demonstrated in late 2014 when KCGIS was hit by a crypto-virus extortion attack. Isolating the virus and getting back in operation was a challenge, but well-defined processes made the response successful. KCGIS is taking its self-assessment one step further. It is conducting a self-assessment of its entire five-person GIS management team against the GMI Geospatial Management Competency Model (GMCM). This assessment looks at each of the 18 competency clusters within the GMCM. The team is rating itself against a management competency assessment rating scale developed by the National Institutes of Health and modified for GIS use by the URISA GMI Committee. Agency data will populate a permanent GMI GIS Assessment Database, so that agencies can perform reevaluations in the future to validate progress developing their capability and maturity. Agencies will also be asked to assess their GIS management team against the GMCM. This will provide further insight into their operational resiliency. Agencies will also complete a GIS metric survey. This will allow GIS operations to compare themselves against self-defined peer agencies. The GIS Assessment Service will include a GMI validation process and a customized report that provides suggestions for priority capability enhancements and process maturity improvements. The GMI will build a repository of best practices that can be shared within the GIS management community. Part of this process will include the development of formal peer-reviewed GIS management best practices. The GMI database will develop a body of comparable performance metrics that can be used by GIS managers and decision makers to make knowledge-based decisions about the desired level of investment in their GIS program. A key concept of the GMI GIS Assessment Service is that process maturity improvements can result in a big increase in the effectiveness and return on investment (ROI) from any given level of investment in GIS. This will provide a valuable tool for GIS managers and decision makers to make informed investment decisions in GIS development and operations. GIS operations will become more capable and mature by utilizing the URISA GMI GIS Assessment Service. GIS managers everywhere will have a valuable tool to help their operations maximize their potential and make progress toward a sustainable future. GIS managers themselves will be able to refine their professional competency and advance their careers using GMI products and services. Greg Babinski, GISP, is the finance and marketing manager for the King County GIS Center in Seattle, Washington. He holds a master’s degree in geography and is a URISA past president. He may be contacted at greg.babinski@kingcounty.gov. Amy Esnard, GISP, is currently a business development manager for Data Transfer Solutions, LLC—Western US Region and International Territories, and a strategic GIS business consultant in Hood River, Oregon. She holds a master of science degree in GIS and currently serves as a director on the URISA Board of Directors. She can be contacted at aesnard@dtsgis.com.